Home / Business and Marketing / Axis Bank ATM Fraud-You could be next victim! The issue has been resolved. I have received an email from ICICI bank stating that Axis bank has accepted the error. I don't know how they conducted the investigation or how they plan to prevent this in feature, but since my money is back, they are not bound to explain me all that. I am happy to know that a strong and reliable process exists to handle this kind of disputes. I have occasionally heard about ATM frauds- less cash coming out or worse no cash coming out at all. But my faith in banking system was intact as I knew there is a reconciliation mechanism which detects if cash left in ATM is more that what it was supposed to be and could be adjusted against customers who got less money and complained about it. Over past 15 years since I got a ATM card, I have not had any issue with cash withdrawals, so I was indifferent to the pain of people who had issues with ATM cash withdrawal. Yesterday, I ended up on the receiving side for what appears to be a carefully planted fraud by ATM cash loaders of Axis Bank. 13th June, 6.50 PM: On my way home, I stopped by at Axis Bank ATM in Medavakkam, Chennai. (Photo below, taken next day morning). 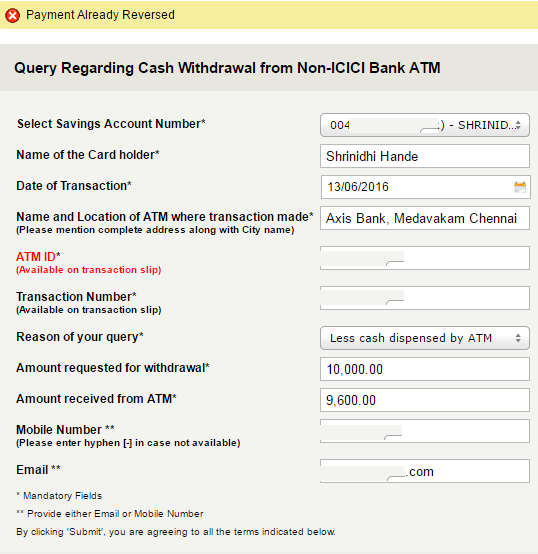 I used my ICICI Bank issued Debit card to withdraw Rs 10000 (I wanted more as I had to buy Forex for my next trip, but ATM imposed a limit of Rs 10000). Transaction seemed to go through and cash came out. ATMs dispel all 500 Rs notes together and all 100 Rs notes together- they are never randomly mixed. As I counted, I noticed one Rs 100 note in between 18 other 500 Rs notes and 5 Rs 100 notes. This adds up only to Rs 9600 and NOT the Rs 10000 I had wanted. Clearly the cash loaders planted a Rs 100 note in Rs 500 tray (and pocketed the balance). ATM had no security guard, No transactions slip came out (most ATMs will be out of paper). Though I detected the shortfall in ATM itself, there was no mechanism to raise a concern. Branch is also not nearby and it was not branch open hours to visit. Thus I had to leave the ATM and head home, hoping that our banking industry will have some mechanism to address this kind of concerns. I put a tweet to Axis Bank, who promptly replied with customer care email and asked me to send details. I sent all the details and an hour later, I promptly got a reply from Axis bank stating that I should take up the issue with card issuing bank, which is ICICI in this case. It was Axis Bank's ATM and their cash loaders, so clearly Axis Bank has its side of investigation to do. Next I logged into my ICICI bank account to log a complaint. When I went to relevant section, it asked for all details, including ATM ID and transaction number. Since no transaction slip came out, I didn’t have those details. I checked SMS and email alert sent by ICICI Bank immediately after withdrawal. Unfortunately the email and SMS alert also had no details of ATM, Transaction ID. It only stated NFS/CASH WDL/13-06-16. How hard it is to include this vital information in the email alert? I tried to log a complaint anyway with a dummy number, but got a strange message stating below. But it was not true- my account was debited Rs 10000 and there is no credit back of Rs 400 difference. I asked ICICI bank twitter handle for an Email ID to which I can send the details. They never cared to reply on time, but replied later next day. I called ICICI bank phone banking and have logged a complaint. Below is what the phone banking officer said. So at this moment, I have an assurance that ICICI Bank will investigate this issue, but final outcome is still uncertain. I have urged phone banking office to note that I got a Rs 100 note in between other Rs 500 notes. Hopefully they will factor this and investigate accordingly, not just do a customary check of no of notes dispensed as per machine stats and conclude everything is fine. I will keep you posted. 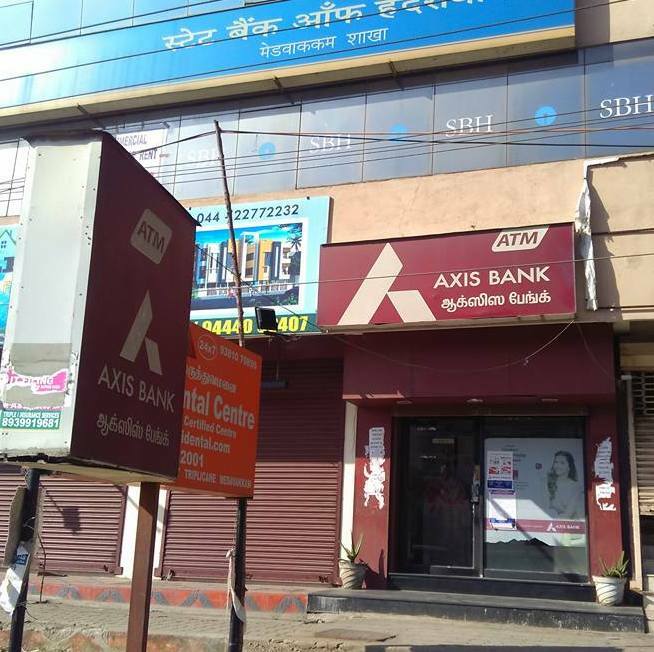 Will I be safe if I don’t use AXIS Bank ATM? Not necessarily. Cash loading is outsourced to private agencies. Same agency might be serving several banks. If some cash loader has mastered the art of cheating ATMs, they can try it on any ATM. What precautions we can take to avoid being scammed at the ATMs? - Where possible use online/credit/debit cards/cheque instead of cash payment. Those are way easier to track and rectify. - If you are withdrawing small amount, withdraw in multiples of 100- like Rs 400 at a time. Probability of someone loading Rs 10 note in Rs 100 tray of the ATM machine is near zero, so you will be safe. - If you are withdrawing huge amount, it might be safer to visit the branch and withdraw instead of ATM. If not possible, take out your phone, make a video of the entire process, and count the cash on video as soon as it comes out. If it is less, then you have good evidence. At the minimum you will have viral video for your youtube account. If all’s fine you can delete the video. - If you forgot to make video and got less cash, show it immediately to the CCTV camera in the ATM and express your frustration. Will sever as proof later. - Never say No to the transaction slip. Report to Card issuing bank through internet banking or phone banking. They will investigate the matter. 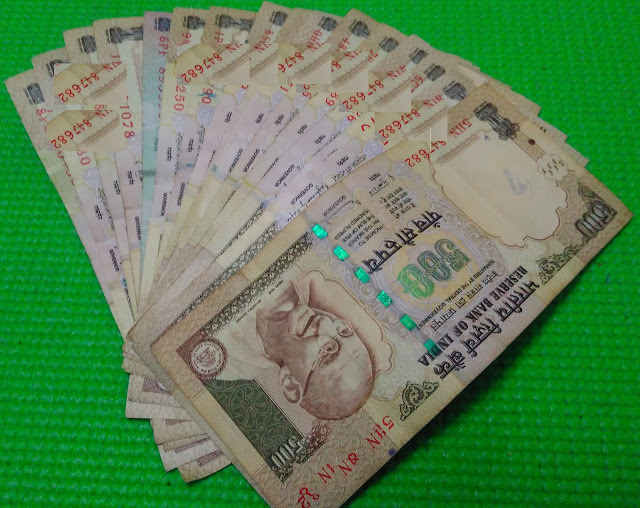 Type 1: ATM dispensed less no of notes: If there is a counting problem and ATM dispensed say 9 notes instead of 10, bank will find out that there is one extra note in the cash tray. They can map it to the dispute you’ve raised and can give you the refund. Type 2: Rs 100 note coming out in between Rs 500- I am not sure how this can be tracked and rectified. As far as I know, ATM machines can count the notes, but don’t think they measure the dimension or read a note to ensure it is what it is supposed to be. If ATM Cash loader has deliberately loaded a piece of paper or lesser denomination note, machine doesn’t have a mechanism to identify and remove them. In my case ATM thought it is dispensing Rs 500 note and counted total accordingly, while in reality loader had placed Rs 100 note instead of Rs 500, making me poorer by Rs 400. Need to see if how this can be tracked and resolved. ATMs may have CCTV but will it focus on cash loading process (to check if one has put Rs 100 note instead of 500)- I am not sure. With this experience, I am going to be way more careful with cash withdrawals from now on. What Banks can do to avoid this? 3) Even if they raise a complaint, bank officials will NOT be able to prove the fraud and trace it back to him. Whoever he is, he’s not been lucky on first two part, but last thing is not in my control. Will the Axis Bank officials pursue this seriously? Will they check all other ATMs loaded by same person to check if has tried similar trick elsewhere? Or will they claim nothing is at fault? We should know in a few days. If Bank authorities have no way to identify that Rs 100 note went out from Rs 500 tray in the automated teller machine, they might reject my claim and the staff who loaded the tray would feel invincible and will try it more often at more ATMs, cheating more people of their money and shaking the foundation of banking system- Trust. Even if it is an accidental mistake, it is not acceptable. Banking transactions should never rely on luck and should be 100% fool proof. It should be relatively easier to add sensors in ATM machine that can check note dimensions before dispensing. If any note is smaller or larger than the designated note, such notes should not be dispensed. 2. Got one call from ICICI team acknowledging my complaint and telling me the same thing that was told earlier "They will credit the disputed amount but if the complaint is found invalid after investigation it will be reversed"
4. ICICI's Google Plus account has commented on this post promising quick action. Thanks for sharing Shrinidhi. Will be careful while transacting at the ATMs. As you mentioned, it's better to deal with plastic money and avoid these kind of issues with cash. Real eye opener.I hardy count the cash dispensed by ATMs.Hence forth shall be carefull. Your experience is an eye opener! Thanks for sharing! Very sad. Hope the matter will be resolved soon. I guess if the loaded 100 Rs notes in 500 Rs block, then the bank would have received similar complaints from other customers also. I think it supports your case. Let's see what will come out. Please keep us informed. Shocking and sad! The no paper slip bcause the machine ran out of paper is so common at many ATMs. Thanks for pointing it out how important it is to keep this slip for any communication with bank. Hopefully the issue would be sorted out soon. You have a nice trip, Srinidhi! Very sad!!! Thanks for sharing Shrinidhi. Its unfortunate to see such kind of problem caused to the end user. Well banks need to make more foolproof systems and you have mentioned the probable solutions for it as well. Hope you get the refund and permanent solution to this problem. Eye opener indeed! Thanks for sharing. Hi SHRINIDHI HANDE, we regret the inconvenience caused to you. We are keen to assist you. Our officials will contact you shortly and help resolve your concern. Thanks. Will keep everyone posted. @Bushra- Thanks. You noted the trip part among all these- great! I dont know about ICICI ,all nationalized banks have somebody called as regional managers who are responsible for a given region. I suggest you try and bring it to their attention and also mark a copy to the police commissioner.I am sure the modus operandi is to try and get away with a relatively smaller crime. Really a sad state of affairs. It was an eye opener for me. A first. I always count my money if it's upto 5K but now on I'll try to count always. But still we do not know what will really help us if we are in a similar situation. Thanks for sharing Shrinidhi. Hope the issue gets resolved soon. The exhaustive comments from you would remain an eye-opener for many...! In fact, as usual, we depend on Machines, (better than humans)while thinking of cash at odd hours, but this type of 'error' would not be anticipated by many....Thanks a lot. "Devaru nimage Olleythu maadali"
Thanks for this post. I did not count or see what notes I receive from an ATM. It used to be blind trust on the ATM machine. But from now on, I will make sure to count my cash. @G Raman- thanks for your comments. @All: No updates from the bank today. Machines are also turning deceptive! or the people responsible for loading these machines!